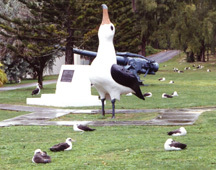 Located roughly halfway between Tokyo and San Francisco, the aptly-named Midway Atoll became the focus of the Second World War in the summer of 1942. “Midway acts as a sentry for Hawaii,” Admiral Chuichi Nagumo pointed out; any Japanese invasion of the Hawaiian Islands would have to be preceded by capture of the tiny islands. And any such operation would surely bring out the American fleet to oppose it. The Japanese attempted to take Midway in 1942, in an effort to lure the Americans into battle rather than as a step toward Hawaii's conquest. 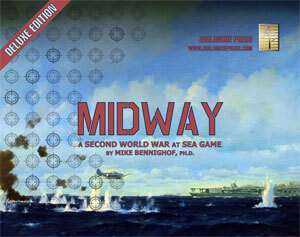 They got what they wanted, though not their preferred result, and the climactic battle is the focus of our Second World War at Sea: Midway Deluxe Edition game. Midway consists of two small islands, prosaically named Sand and Eastern. The larger of the two, Sand is about 2200 meters long by abut 1500 wide, while Eastern is about a 1800 meters long and 1100 meters wide. The two islands are on the southern edge of the coral reef, which is about five miles in diameter and encloses a lagoon that gets as deep as 25 to 50 feet in its center. Geologically, some claim is not actually part of the Hawaiian chain though it lies along the progression of islets. Midway as seen in November 1941. Eastern Island with the airfield is in the foreground. Both islands were typical sandy desert isles when discovered, but in the past century and a half shrubs, grass and trees have been planted on both. Midway was apparently not discovered until 1859, when Capt. N.C. Brooks of the bark Gambia laid claim to them in the name of the United States. As Gambia was a Hawaiian-flagged vessel, it's very likely that Brooks sighted the islands some weeks before his purported discovery and sold the information to the North Pacific Mail and Steamship Company. The United States finally took possession in 1867, and in 1870 a naval construction crew spent seven months trying to blast a channel through the reefs into the lagoon so a coaling station could be established. They eventually gave up the effort and Midway became the preserve of shipwrecked sailors and naturalists, plus huge numbers of albatrosses and other sea birds and the Japanese egg poachers who preyed on them. A naval “governor” was assigned to oversee the atoll, but he was billeted in Honolulu and given other duties, and so rarely visited his province. One of the early governors, Cdr. Hugh Rodman (who would later command the American Sixth Battle Squadron attached to the Grand Fleet during World War One), sailed to the islands to investigate tales of bird poaching. He found a Japanese schooner anchored in the lagoon, its crew having dug huge pits in the sand into which they drove the albatrosses, who could not take off without a running start. The birds died slow and miserable deaths, and then the poachers harvested their feathers. Other teams would walk along the shore, one man whacking the bird with a stock, the second chopping off its wings and the third packing the severed wings in crates. The live, wingless albatross was then left to expire on the sand. Midway's giant "Gooney Bird" statue. In the background is the five-inch gun where Marine Lt. George Canon died at his post returning the fire of the Japanese destroyer Arashio on December 7th, 1941. Canon refused evacuation and was awarded the Medal of Honor. Rodman, infuriated at the sights, boarded the schooner waving his sword and pistol in the air and screaming long strings of powerful sailors’ oaths - the commander knew how the sea gods punish those who harm an albatross. The poachers did not speak English, but quickly packed up and sailed away to escape the madman. Though Rodman later held that he had chased them away for good, poachers would return a few years later. The atoll gained brief international notoriety in 1892, when Robert Louis Stevenson set his novel The Wrecker on Midway, based on the shipwreck of the Wandering Minstrel three years before. But otherwise, few had any interest in the isolated islands. A cable station opened in 1903, and the manager began importing trees, birds and topsoil to ease the post’s loneliness. He also reported the egg poachers, and the next year 21 Marines with two six-pounder cannon arrived to drive off “the marauders.” The tiny garrison remained for four years. Afterwards the island remained forgotten by most until 1935, when Pan American Airways established a seaplane base for its Manila Clipper air service. Pan Am built a power plant, service buildings and a hotel on Sand Island. Following that recommendation, serious work began on the islands by the end of 1939, progressing slowly as funding allowed. Dredges opened a channel into the lagoon, with an eye toward building a submarine base on Sand Island. Construction crews began putting up barracks and workshops. Looming international tension caused Midway to be designated a “National Defense Area” in February 1941. The pace of work increased and the 3rd Marine Defense Battalion was assigned to garrison the islands. 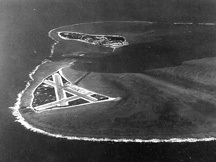 By August the Naval Air Station was operational, with runways covering most of Eastern Island. At first, only a squadron of Navy PBY Catalina seaplanes was present, as the airfield lacked the service infrastructure to support more aircraft. Marines installed a variety of three-inch naval and anti-aircraft guns and five-inch coast defense guns as well as four antiquated seven-inch guns. War came to Midway on the night of 7 December 1941. The Air Station had been expecting its first land-based planes, a squadron of Marine dive bombers to be delivered by the carrier Lexington. The carrier instead was diverted to search for the Japanese fleet, and the Marine garrison went to full alert. At 2135 two Japanese destroyers commenced a bombardment of the islands, damaging a hangar and the main fire control center. The Americans suffered four dead and 10 wounded, and while they claimed three hits on one of the destroyers this result seems unlikely. On 17 December the combat planes finally arrived, a squadron of SB2U dive bombers. A squadron of F2A Buffalo fighters followed later in the month. In March 1942, both squadrons were reinforced and split into two squadrons, and a Marine Air Group command was set up to coordinate them. Midway's seaplane hangar burns, 8 December 1941. In early May, Admiral Chester Nimitz inspected the island's defenses, aware that Col. Jimmy Doolittle’s raid on Japan had provoked the Japanese to seize Midway, the base from which they believed the raid had been initiated. Nimitz allotted the Marine and Navy commanders on the island all the reinforcements they requested: additional anti-aircraft and coast-defense guns, two companies of Marine Raiders, five light tanks, 16 SBD dive bombers and seven F4F Wildcat fighters. The Army Air Force contributed a squadron of B-17 bombers and a handful of B-26 attack planes, while the Navy added six TBF torpedo bombers. By the time the Japanese launched their "Midway Operation," the atoll had as large a garrison as could be sustained on the two small islands - four companies of infantry, half of them elite Raiders, a handful of tanks, six coast-defense batteries, and large numbers of anti-aircraft guns. The Japanese landing force consisted of one oversized battalion of Special Naval Landing Force troops (5th Yokosuka) and the Army's battalion-sized Ichiki Detachment, which would later be wiped out on Guadalcanal. Two construction battalions (11th and 12th) would follow up, to restore the airfield to operation as quickly as possible and install coast-defense guns (these were American weapons captured on Wake Island - Japan faced a serious shortage of heavy guns). The Japanese planned to land across the southern beaches, the SNLF troops on Sand Island and the Army on Eastern. Success in capturing the atoll would have depended on outside assistance: would the Japanese carriers be able to lend support with their aircraft, or would the Americans be able to provide air support to the defenders and reinforce them? The Japanese needed such support more than did the Americans, and once the carriers had been destroyed there would be no point in executing the landing. But that's another story. 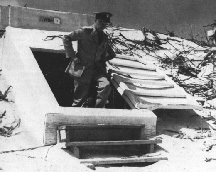 Adm. Chester Nimitz inspects a Marine bomb shelter, May 1942. Had the Japanese wished to capture Midway, their best chance came on December 7th. Though alerted, the Marine garrison did not yet include combat aircraft and the coastal artillery was limited. But the entire mission of the “Midway Neutralization Unit” was typical of the overwrought planning of the Imperial Japanese Navy. Two destroyers had little chance of inflicting serious harm on the island's defenses, and placing another task force at sea only raised the chances of premature discovery of the Pearl Harbor operation. Adding three or four destroyer-transports with an SNLF battalion aboard would have given the Japanese a good chance of seizing the atoll, and in the shock that followed Pearl Harbor they would have had an equally good chance of holding it. But one always sees more clearly in hindsight, and the Japanese had little information on the garrison's abilities. After the Battle of Midway, the island became an important submarine base. Midway would serve as a Distant Early Warning station during the early years of the Cold War, and finally lose this function in the 1970’s. In 1997 the Navy abandoned the atoll for good, handing over jurisdiction to the Fish and Wildlife Service.